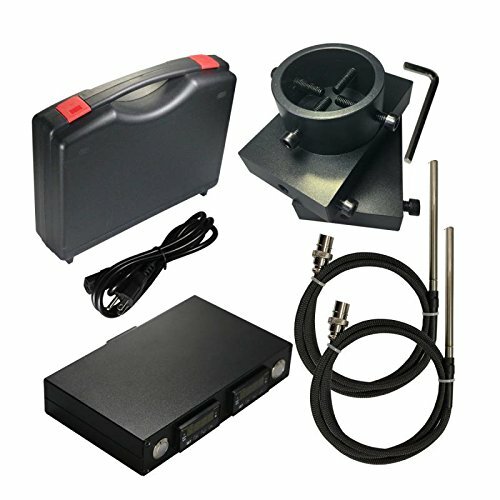 Nice flexible and powerful rosin press heat plates and controller kit. Designed to bolt directly up to hydraulic or pneumatic rams that are no larger than 2.4 inches in diameter and can handle up to 20 tons of pressure. TEFLON COATED to ensure a flawless surface and simple clean up. No more baked on rosin! Plate size: 3x5 inches, plate thickness: 1 inch for each, can handle up to 20 tons of pressure. Top Plate RAM - Inner diameter: 2.45 inch, height: 1.5 inch. Dual PID controller with two heating rods, heats up fast. Maximum temperature: 415F. TEFLON COATED plates to ensure a flawless surface and simple clean up. If you have any questions about this product by Tiroma, contact us by completing and submitting the form below. If you are looking for a specif part number, please include it with your message.